MONARCH M5—the all-new patriarch of the Nikon hunting riflescope family. Engineered from the inside out to check all the boxes on your long-range riflescope wish list, the MONARCH M5 keenly illustrates Nikon’s Glass First principle as it pertains to the development of our hunting optics. The MONARCH M5’s highly efficient 4x zoom optical system was created specifically to deliver a brighter, sharper, higher contrast sight picture for the times you vitally need it—just as the first vestiges of light appear, and disappear into the darkness together with your prey. MONARCH M5’s rugged and robust 30mm main body tube not only protects the riflescope’s optical system—but also increases its internal adjustment range. With Nikon’s MK1-MOA hash mark reticle well integrated into the MONARCH M5 lineup, long-range dialers will be able to make use of the increased elevation travel and windage hold-off points on the reticle. Low profile turrets and caps are ergonomically shaped to match the riflescope’s sleek modern profile, as are its side focus parallax adjustment, zoom ring and ocular focus ring. The new MONARCH M5 line offers models with the newly designed MK1-MOA reticle, as well as the popular BDC and Nikoplex reticle. 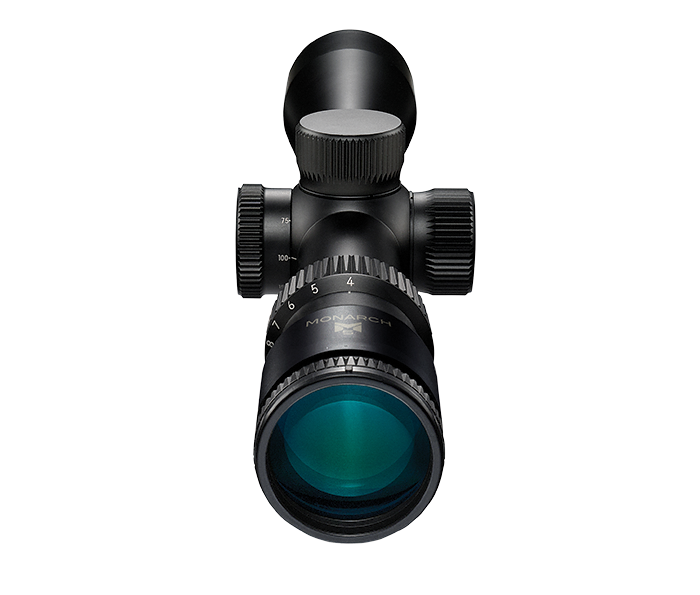 The MK1-MOA reticle can be used to estimate range, target size, elevation holdover and wind-drift at the designated magnification. The asymmetrical design allows for additional holdover for extreme distances. All Nikon reticles can be optimized for any caliber or load with Spot On Ballistic Technology. Constructed of aircraft-grade aluminum with Type-III hard anodizing for maximum strength-to-weight ratio and optimum ruggedness. Precise, positive-click ¼-MOA reticle adjustments to get you zeroed quickly and maintain your setting, even with heavy recoil. Parallax dial allows adjustment without changing shooting position. MONARCH M5 also features aluminum construction for enhanced durability. Low profile turret caps, zoom ring and eyepiece focus share ergonomic knurling design. O-ring sealed to prevent moisture from entering body. Shrugs off hard recoil and rugged use and purged using nitrogen gas for total reliability against thermal shock and internal fogging.